Hi everyone! Kevin is usually the mouthpiece for the comic and I’m the silent partner hunkered down over a computer drawing until all hours of the night. But in this instance, I feel the need to give a little info about something that’s been going on with me. Without going into too much detail, late last year my doctor found something in my body that is, shall we say, “not good” and I’ve had ongoing doctors visits, medication and bodily scans for almost a year now. I’ll be undergoing surgery this week and hopefully this problem should finally be resolved. Once I’m out of the hospital I’ll be recovering for about 6-8 weeks afterwards. But “The Lunatic Fringe” will still go on! Kevin and I have arranged to have pre-drawn comics running while I’m unavailable and I’ll be drawing the comic once again when I’m back from my hospital stay. I’d like to thank Kevin for being so flexible with my schedule during doctors visits and the occasions where I’ve struggled to draw due to not feeling well. This last year has been trying at times and Kevin has been very understanding with my situation. And of course, I’d like thank each and every one of you for reading the comic and supporting us all these years. Our little web comic had grown so much and it’s because of every single one of you. Keep on reading and….GO GIANTS!!! Rule 7.13 (2) was applied correctly yesterday in San Francisco. From the start, Tyler Flowers was in front of the plate. Watch the play. His left foot never leaves foul ground in the entire play. 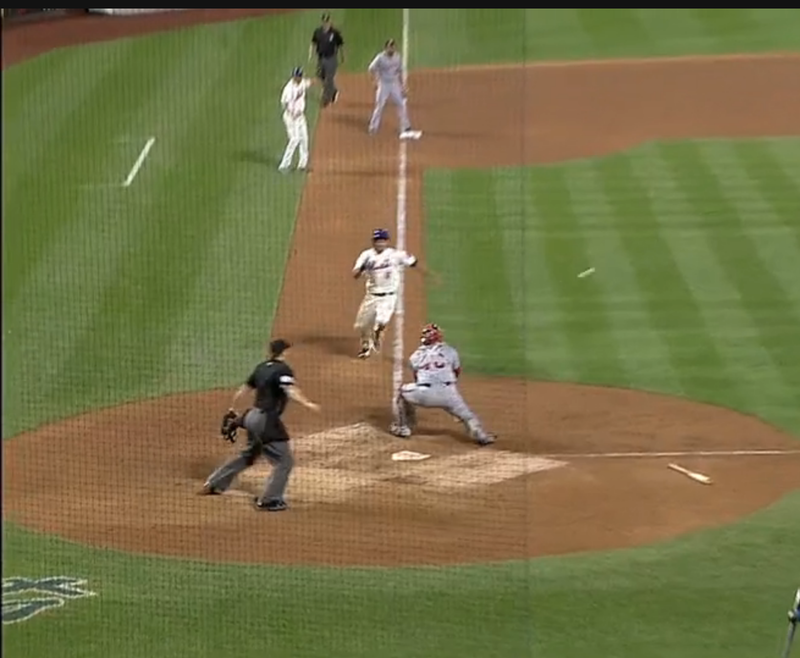 The momentum of the throw didn’t take him into the path of the the runner. He was always there. If, in the judgment of the Umpire, the catcher without possession of the ball blocks the pathway of the runner, the Umpire shall call or signal the runner safe. The bigger debate is whether there should be a rule at all. Your browser does not support iframes. Your browser does not support iframes. Yes. Yes there abso-freaking-lutely be a rule. Avila looks okay at the end of that, but he left the game and had problems the rest of that series. Which the World was watching. You know, because it was the World Series. 1. A runner attempting to score may not deviate from his direct pathway to the plate in order to initiate contact with the catcher (or other player covering home plate). If, in the judgment of the Umpire, a runner attempting to score initiates contact with the catcher (or other player covering home plate) in such a manner, the Umpire shall declare the runner out (even if the player covering home plate loses possession of the ball). In such circumstances, the Umpire shall call the ball dead, and all other base runners shall return to the last base touched at the time of the collision. 2. Unless the catcher is in possession of the ball, the catcher cannot block the pathway of the runner as he is attempting to score. If, in the judgment of the Umpire, the catcher without possession of the ball blocks the pathway of the runner, the Umpire shall call or signal the runner safe. Notwithstanding the above, it shall not be considered a violation of this Rule 7.13 if the catcher blocks the pathway of the runner in order to field a throw, and the Umpire determines that the catcher could not have fielded the ball without blocking the pathway of the runner and that contact with the runner was unavoidable. Isn’t the whole problem that caused replay to be implemented is that the “judgement” of umpires not great? That the judgement of umpires cause rules to be implemented differently at different times and places? And this rule expressly uses the term “If, in the judgement of the Umpire” twice! (And even references it a third time) That’s the problem! Judgement calls cause inequality in rules being applied. 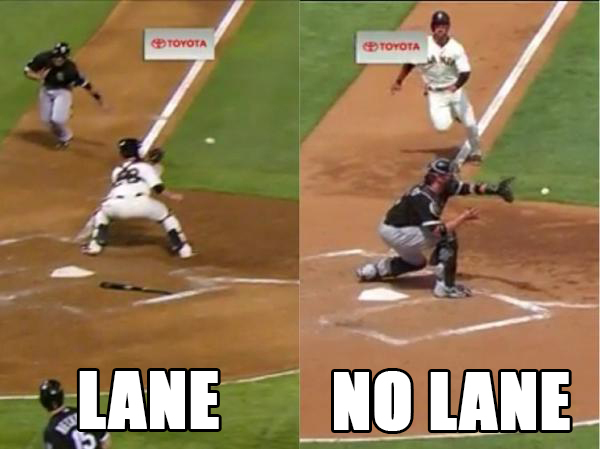 If only we had a clear line with which we could determine where a catcher can be and can’t be. 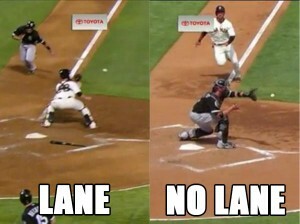 A line that will make it obvious both in live action to the players and to fans and umpires in replay. A line that would create a right side and a wrong side. One where the catcher would be playing fair, or where he was committing a foul. If only we had a clear, visually obvious line.